Skye, sometimes referred to as Tantaga while with Onision, is Greg's ex-wife. They were married for 5 years, from 2005 to 2010. They met in 2003 when they attended the same high school. Skye says she saw Greg for the first time in their high school computer class in 2001, but Greg says he did not notice her because he was still dating Shiree. They did not start talking until 2003 when they both took the same weight-lifting class. Greg says he decided to start talking to her because she had a "dark aura", despite dressing "normally", and she seemed like "she did not need anyone". He says he would start conversations with her every time they had class together, even though she seemed to think he was a "weirdo" for talking to her. He says they began to talk at the bus stop as well, even though she was "still acting distant and like I was weird", but he later believed she wanted him around all along. Skye and her sister, "Netunesa", participated in many of Greg's early websites and videos. For example, they began working on a video series on January 2, 2005 titled Odd Dolls. This was described on their site as dolls doing "hilarious/nasty things to one another.. these things involved such acts as, murder, arson, PDA, swearing, and various other non-PC actions." (Source) They made about 24 episodes. Greg and Skye married on August 5, 2005 in San Antonio, Texas. (Source) For the first few years of their marriage, they moved around because of his military job. Greg revealed a couple of their marriage agreements in a 2010 video titled "Lover's Pact". One is an "honesty pact", to never lie or keep secrets from each other. The other agreement is a "health pact", to stay skinny. He states it would be selfish for one of them to gain weight and not take into consideration the other person's sexual needs. He says it would be hard for them to maintain attraction for the other when they are "intentionally, consciously letting themselves go". ($ource) Greg spoke more about his marriage to Skye on his OnisionSpeaks channel and would give viewers advice about how to have a successful marriage like theirs. It is believed most of these videos were removed from his channel after the divorce. Greg created his Onision YouTube on January 29, 2006. Skye would often act in the Onision Channel skits and appeared in his first viral hit, Banana Song. She would also make appearances in some OnisionSpeaks videos, usually messing around in the background or sitting next to him. Skye also designed some Onision shirts for Greg. Skye was adored by virtually all of Greg's fan base at the time. Toward the end of their marriage, the Onision channel became hugely successful. The channel had reached the Top 100 Most Subscribed YouTubers list by 2010. Greg collaborated and worked with many high ranking YouTubers and channels of the time. On December 24, 2010 Greg announced through his Facebook fanpage that he and Skye had been separated since December 17th. (Source) Many fans were hoping it was a joke, but soon found out it wasn't. As the news spread, it brought mixed emotions to Greg and Skye's fanbase. Most were saddened by the news and some even went as far to say they felt like their own parents were getting a divorce. 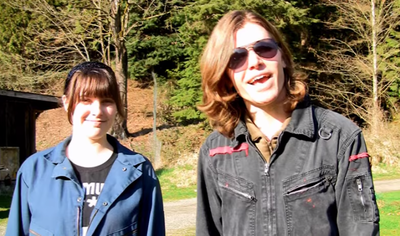 This news came seemingly out of nowhere to fans, as Greg and Skye seemed to be keeping up the same energy and emotions into their videos as when they first started. During this time Greg had his friend Cyr staying at their house. Text at the end of their last video. After officially announcing the divorce, Greg uploaded several videos discussing his divorce. Most, if not all, have been deleted from his channels. Some of the deleted videos that were not saved and re-uploaded by other users included "Onision's Divorce Was A Mistake? 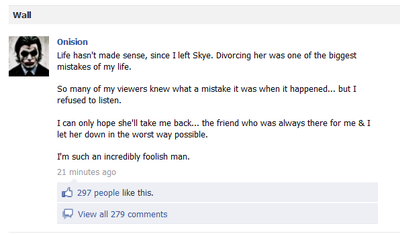 ", "Leave Skye Alone", and "Greg & Skye Divorced". Sometime after Skye had moved out of the home, Greg uploaded the video "Bitter Divorce". In the video he walks around his house as he lists items Skye and her sister have taken from the home. He heavily implies she stole over $2,000 of his items from his home when he was not there. He says he wished she had told him she was going to take items from the home beforehand and that he was still willing the follow the "agreement" they had over living arrangements and monthly payments. Text appears under him, revealing the details. "I agreed to either cover her bills in my home for 2 years, or pay her $1,000 a month for a year outside my home" Greg has since deleted the video. (Source) After uploading this video, he uploaded another video showing surveillance footage of Skye and her sister removing items through his front porch. In the video he says he will take legal action. This video has also been deleted. When talking or blogging about his ex-wife, Skye, Greg often posts the divorce contract he created. The contract is dated December 22, 2010. In the contract Greg states that he would let Skye continue to live in his house rent free until December 22, 2011, 1 year. If she moves out, he states he would pay her $1,000 a month. The contract also states, when Skye signs the papers, she forfeits all home ownership rights to Greg. (Source) Greg often brings up this contract to prove that Skye ignored her signed agreement to him. He says when she and her sister took items from him home, she stole the signed agreement, although he had already made copies. He says in the end, that made no difference. (Source) It is assumed the court did not enforce this agreement because it was not a legally bound contract. Skye perused Greg legally for alimony payments. 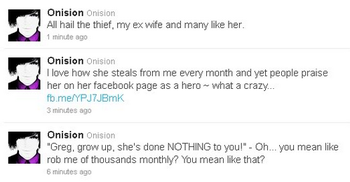 For years Greg has said Skye stole from him by lying about how much money of the Onision business she was entitled to. He says he got scared and settled without stepping into a courthouse. Besides a handful of Speaks and comedy videos covering the divorce around December/January, Greg did not talk about Skye publicly for months. Also, Skye had not made any public appearances since the separation. Greg regretting his divorce with Skye, October 2012. Skye's channel mostly consisted of comedy sketches and occasionally vlogs. Skye created a FellFromTheSkye Facebook fan-page and a FellFromTheSkye Twitter account to communicate with her fans. She would occasionally open up a tinychat room to chat with her fans. Skye's last video was uploaded on April 12, 2012. (Source) Her last tweet and Facebook status were promoting this video. After that, she vanished from the public eye and has not returned since. It is rumored she abandoned her accounts because could not take the threats and harassment from Greg's fans anymore after he began publicly complaining about their alimony agreement (see below). It is also rumored she left YouTube to become a student. 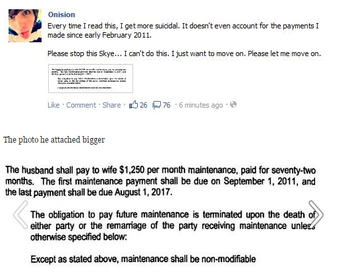 In April 2012, Onision began talking about his alimony again. He posted a few videos and many statuses talking about becoming suicidal over the alimony agreement and begging Skye to terminate the agreement. The Facebook statuses and Speaks videos sent some fans over the edge and they began to increase the threats and hate on Skye's accounts. The attacks were noticeably more extreme and frequent than ever before. (Source) The fans' attacks along with Greg's statuses and videos directed toward her are rumored to be the reason behind her abrupt disappearance from her YouTube and her FellFromTheSkye social media accounts. Greg continued to publicly complain about his alimony and accuse Skye of being a lying thief on blogs and videos for years, although he never spoke about being suicidal over it after April 2012. A few years after the initial alimony complaints, Greg stopped talking about it about it publicly for a few years. It is speculated this was because his channels were producing more money. His last payment was due August 2017. Greg continues to bring up Skye in videos. Skye has not returned to the public eye since 2012. This page has been accessed 88,745 times.